My latest project was inspired by one of my favorite bloggers and friend, Angie, from the Knick of Time blog. This is just one of Angie's Loaf Pan Wall Bin display projects. 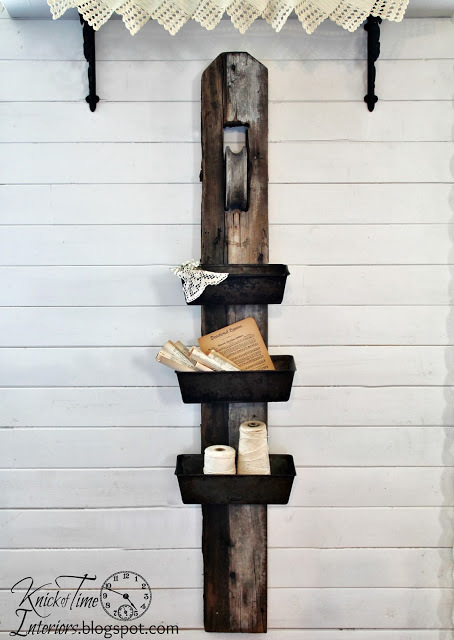 In this project, Angie used an old barn pulley mounted on a board and loaf pans. I used just an old board painted with Annie Sloan Chalk Paint in Pure White. I wet distressed the board so the paint wasn't perfect. Then I added this antique wringer graphic also from Angie's blog with the Modge Pod Image Transfer Method. I waxed the graphic and the rest of the board with ASCP clear wax. The loaf pans are attached from the front of the board with wood screws. The display possibilities are endless with this piece, from faux plants, to crochet thread spools, to photos and booklets. The wringer graphic is perfect for a farmhouse style laundry room or kitchen! Love this! I have a few loaf pans that I plan on using on a message center. I love what you did with yours! Looks great! Love the look with the pans! Like the old washboards grouped together! I absolutely love your version, Carlene! Adding the wringer graphic at the top was genius! So cute, Carlene! While Angie certainly put these beauties on the map, your version is really OC cool! You know what I'm missing in my house? Enough walls to make fabulous projects like this one - I just LOVE it ! Love this project, Carlene. So clever the way you have it displayed too.